MU junior Jaylon McClain-Sapp stops North Carolina State freshman Trent Pennix (26) behind the line of scrimmage, during Marshall’s 37-20 setback on Saturday at Joan C. Edwards Stadium in Huntington, W.Va.
HUNTINGTON, W.Va. — Only one team could remain unbeaten, and the Wolfpack offense made sure it was the guests. 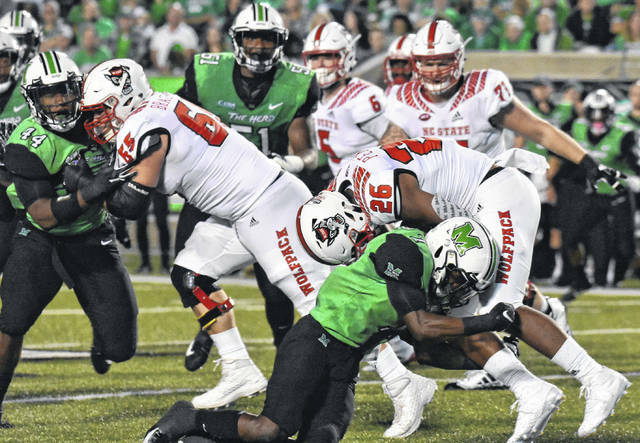 The North Carolina State football team outgained host Marshall by 178 yards on Saturday, as the Wolfpack handed the Thundering Herd its first loss of the season by a 37-20 count, in front of 32,349 in attendance at Joan C. Edwards Stadium. Defense was showcased first, as the opening three drives of the game resulted in punts, two by Marshall (2-1) and one by NC State (3-0). The Wolfpack broke the scoreless tie with 4:45 left in the first quarter, as Christopher Dunn hit a 30-yard field goal to cap off a 12-play, 61-yard drive. Marshall punted after four plays on its next drive, and NC State took over at its own 20. The Wolfpack moved the ball 80 yards in eight plays and Reggie Gallaspy Jr. scored with a one-yard run on the first play of the second quarter. The Herd needed just two plays to answer the touchdown, as Isaiah Green tossed an 82-yard touchdown pass to Marcel Williams with 14:02 left in the half. On the ensuing drive, NC State made it 61 yards in 10 plays before settling for a 32-yard Dunn field goal, making the advantage 13-7. Marshall had to punt on its next possession, and the Wolfpack went 70 yards in eight plays, with Gallaspy scoring on a one-yard run with 2:33 left in the half. The turnover bug bit the hosts on the their next possession, as Nick McCloud recovered a fumble for the Wolfpack with just 30 seconds left in the half. It was enough time for Dunn to hit a 26-yard field goal, giving NC State a 23-7 lead at the break. The Thundering Herd defense came up with a stop on the first drive of the second half, and Marshall made it a 13-point game with 9:20 left in the third, as Justin Rohrwasser made a 32-yard field goal. On the ensuing kickoff, Jaquan Yulee forced a fumble, and then Artis Johnson scooped the ball and ran 22 yards for the touchdown, trimming the Wolfpack lead to six points, at 23-17. The guests gained some breathing room on their next drive, as Ryan Finley found Emeka Emezie for a 30-yard touchdown pass with 7:24 left in the third. Marshall was held to a 29-yard Rohrwasser field goal on the next drive, making the Wolfpack lead 30-20. NC State went three-and-out on its next possession, but Jarius Morehead picked off an MU pass and returned it 57-yards for a touchdown with 28 seconds left in the third. Marshall was forced to punt, tossed an interception and had the game clock run out on its final three drives of the night, leaving the Wolfpack with the 37-20 victory. 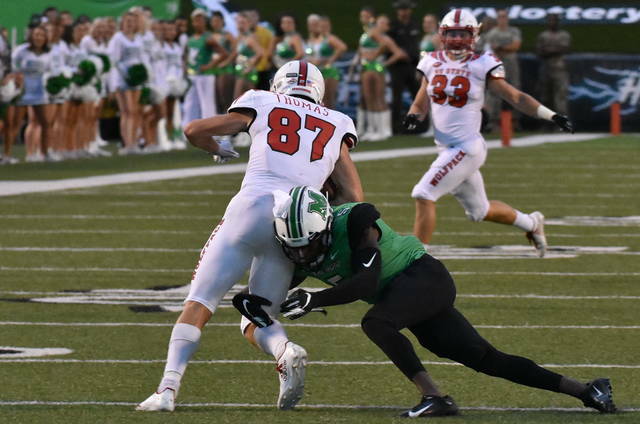 Following the first loss of the season, Herd head coach Doc Holliday acknowledged that his team didn’t do enough to beat a team like the Wolfpack. 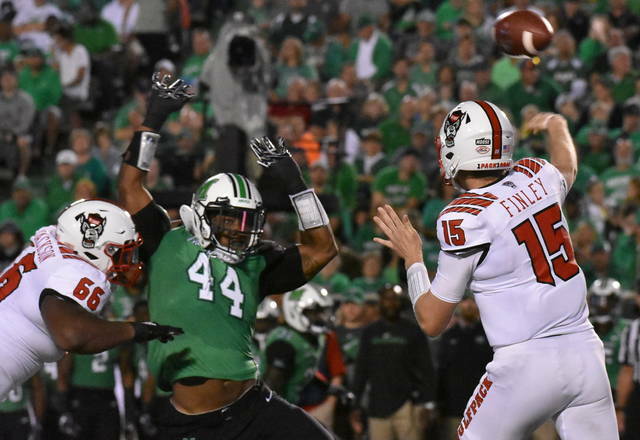 NC State held a 24-to-15 edge in first downs and converted on third down 52.9 percent of the time, while Marshall made just 37.5 percent of their third down tries. 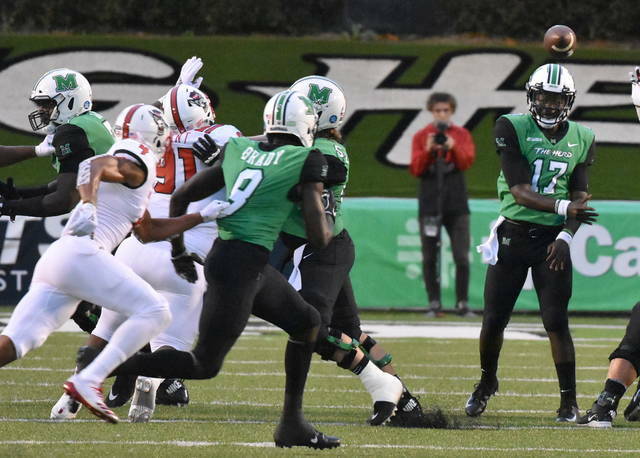 The guests won the turnover battle by a 3-1 count and punted four times, compared to five punts by Marshall. The Wolfpack earned a 377-to-270 advantage in passing yards, while rushing for 125 yards and holding the Herd to just 54 yards on 22 carries. Holliday noted the troubles facing the Herd if the running game doesn’t get turned around. Green — who carried the ball four times and gained seven yards — was 22-of-43 through the air for the Herd, earning 270 yards and a touchdown. Keion Davis led the team with six receptions for 99 yards, while carrying the ball seven times for 17 yards. Williams had four receptions for 87 yards and a touchdown, Tyre Brady was held to 25 yards on three receptions, while Tyler King had a team-best 30 yards on nine rush attempts, to go with three yards over a pair of receptions. Armani Levias, Obi Obialo, and Xavier Gaines each had two receptions, with 26, 12 and eight yards respectively. Willie Johnson had eight total yards with one catch and one carry, while Anthony Anderson picked up two yards on one tote. Channing Hames and Chase Hancock combined for a sack for the MU defense, with Hancock and Marquis Couch each earning a team-best 1.5 tackles for a loss. Hancock, Frankie Hernandez and Malik Gant had eight tackles apiece to lead the Herd, while Kereon Merrell earned a team-best two pass break-ups. For the victors, Finley completed 23-of-40 pass attempts for 377 yards and a touchdown. Gallaspy had a game-best 81 yards and two touchdowns on 22 carries, while Kelvin Harmon led the NCSU receiving unit with 150 yards on six receptions. Germaine Pratt led the Wolfpack with 11 tackles, including one for a loss. James Smith-Williams had the team’s lone sack, but the guests earned a total of 12 quarterback hits on the MU freshman. The game was played in front of the 12th-largest crowd in Edwards Stadium history, and NC State is now 5-0 in all-time meetings with the Herd. Next, Marshall begins its Conference USA at Western Kentucky on Saturday at 7:30 p.m.